One of Japan's largest resorts with 99 hotels to choose from. Selected at the location for the Downhill in the 1998 Winter Olympics and also hosted the Nordic Combined, Ski Jump and Cross-Country skiing events at the Olympic Games. It is also part of the giant Hakuba ski region. Most of the skiing is of intermediate standard accessed by a gondola to the middle station at 1400m, however Happo does have more tough terrain than most Japanese ski areas and more terrain full stop. Great snow record ensures a long season through to mid-May most seasons. When will it snow in Happo One? 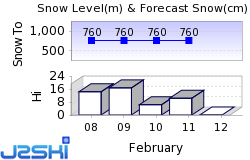 The next notable snow forecast for Happo One is 7cm3in, expected on 27 April, with around 7cm3in forecast over the next 7 days. How High is Happo One? The Japanese Ski Resort of Happo One is one of the larger Ski Resorts in Japan and has direct access to 39km24 miles of downhill skiing, served by a total of 34 ski lifts. At the beginning of the century, people living in the mountainous regions on the Japan Sea coast were using primitive long pine skis with bamboo poles to get around. Enjoyment and sport were far from those peoples' minds as they tried to survive in areas where 4 to 5m of snow was not uncommon. The idea that this form of transportation could be fun was brought to Japan by the Austrians when Hannes Schneider introduced lighter skis and bindings in the 1930's. Herr Schneider, complete with fancy 3-piece suit impressed the Japanese and the skiing boom took off. The affluent eighties saw some serious winter resort development with many new resorts appearing and existing resorts being expanded. Pronounced Ha-Pony, Happo One is one of eight ski areas in the Hakuba Valley and it's the place to head for if you're looking for a bit of everything for the price of one lift ticket. It's a large scale resort boasting some of the highest snowfalls and longest vertical pitches in Japan. Due to its altitude, Happo One has breathtaking scenery, and its dry climate enables skiers to experience fantastic powder skiing. If Happo had to be described in one word it would be variety, exploring its maze of lifts and runs is always an adventure. Terrain goes from gentle beginner-friendly glades of the Saka area on the northern side, to mogul fields and steeps at higher altitudes. The world-class halfpipe and fun park in the Nakeyama area of the mountain provides excitement and adventure for 'boarders and spectators. Happo One received international attention in 1998 as host to both the mens' and womens' downhill, giant slalom and ski jump events during the Nagano Olympics. It was at those Games that Austrian's Hermann Maier won double gold in the Downhill and Giant Slalom. The longest possible descent in Happo One is 8km5 miles long. Happo is a large scale resort with a total of 33 lifts, and more than 1000m of vertical skiing. From the complete novice to the expert skier, Happo-One provides some of the best skiing in all of Japan. It offers everything from gentle beginner slopes, to bumps and long cruising trails. Its known as the place to go extreme in Japan, ride all the way to the to the top by chairlift and a short hike takes you into the steep off-piste. These off-piste areas are not patrolled though and there is avalanche danger so caution is advised. Due to the excellent snow record the ski season usually lasts through to mid-May. All of the ski resorts in the Hakuba Valley and Niseko use an electronic lift pass system. The pass is a reprogrammable computer chip encased in a small plastic covering. Placed into customer's ski clothing or gloves, it allows guests to pass through the electronic gates at each lift. When a lift pass is purchased a 1000 yen deposit is required. The 1000 yen is refunded when the pass is put into an automatic exchange machine located near the ticket selling booths. Most hotels have a limited stock of mid-range ski and snowboard rental equipment. For the latest range of performance equipment and a full range of sizes the specialist ski rental shops offer a far superior service. The largest ski and snowboard boot sizes available in Japan for rental are 32cm or US 13. English language ski and snowboard instruction can be organised but must be pre-booked as with private lessons. Groups lessons are only taught in Japanese. Happo One opened its slopes to snowboarders for the 1999/2000 season with a machine groomed halfpipe and a terrain park. The Japan Snowboard Open was held here in 2000. The Pipe is groomed daily and has a lift running right from the bottom to the top. The park, on the adjacent slope, typically sports a large table top jump as its main attraction accompanied by some smaller jumps and a railslide. For some good free-riding take the gondola to the top and head into the valley (to your right as you look up the hill from the gondola lodge). The pipe and terrain park are usually both open in the evening and normally not too busy. When is Happo One open? We don't currently have confirmed season dates for Happo One. NOTE:- Lift and Piste openings are always subject to Snow Conditions in Happo One. The 34 ski lifts of Happo One are able to uplift 46,324 skiers and snowboarders every hour. Happo One is in the Japanese Alps in Tochigi, Japan. The nearest airports to Happo One are Tokyo and Narita, all within three hours drive. Described by some as the perfect party town, Happo One is crammed with bars, restaurants, souvenir shops and karaoke bars. One of the main Japanese apres-ski activities is a visit to the onsen - a place where medicinal hot water comes gushing out of the ground 24 hours a day. Happo has an abundance of these hot spas, and at a hot spring inn any time is bath time - the perfect way to relax after a strenuous day on the slopes. Other popular Ski Areas near Happo One. Common questions about Happo One. Want to ask about skiing and snowboarding in Happo One? Or contact Happo One Tourist Office. Note :- The information on J2Ski concerning Happo One, where not clearly factual, is opinion only and is neither definitive or exhaustive.